It's a challenge for photomapping projects like urban planning, transportation, land administration, public utilities services including, electric, gas, water, sewerage, etc., require highly detailed photogrammetric production services without an expert team in place. Outsource2india works as your Orthophoto production services partner and offers benefits in terms of accurate imaging, timely delivery, large scale project mapping, and uniform geometry. By combining data from aerial imagery and required GIS systems, O2I produces fast, robust, and dynamic photogrammetric representations. Outsource2india's high-quality Orthophoto production services, including digital photography and aerial Orthophotography for a variety of deliverables using diverse representation techniques. 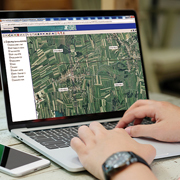 Our precision-oriented work is geared to effectively support the minutest requirements in the creation of Geographical Information Systems (GIS), with Orthophoto Production being our area of expertise. With over two decades' experience in digital orthophotography creation, the team has worked with a wide range of clients from across the globe and has a track record of offering smooth operations and reliable results. Outsource2india has proven experience in offering orthophoto and aerial photography mapping services, and has successfully delivered projects that require Thermal Imagery Processing, RGB & CIR Orthophotography and Black & White Orthophotography. Orthorectification Services - O2I helps to remove the effects of image perspective as well as relief effects and creates a planimetrically correct image from orthorectified aerial imagery. This process allows us to get accurate measurement of distance between angles and areas. These images can be used as in various visualization tools including Google Earth, ArcMap, WMS, OSSIM Planet, etc. The accuracy of orthoimage is entirely based on the preciseness of the triangulation, i.e., orientation and adjustment of any block, resolution of the source image as well as the accuracy of the elevation model. Ortho Mosaicking Services - Orthorectification and Mosaicking are combined to obtain the desired detailed photomaps and mosaics. Our experts work towards correcting this image distortion using the latest technology and tools. This task involves correcting the image distortions caused by software features or terrain elevation. Mosaicking services including stitching the image together from disparate images into one single view visual. Color Balancing - Colored and black & white Orthophotos are precisely marked for better mapping purposes. O2I also ensures accurate color balancing, Seamline editing, and tile cutting services. Thermal Imagery Services - Outsource2india provides detailed thermal imagery services to meet various digital photography, aerial photography, analysis and urban planning requirements. Outsource2india's Orthophoto Production team understands that each of these required images warrant meticulous observations, recordings, and carries the weight of a well-mapped urban development or utility plan that affects communities. Keeping this in mind, the team swears by process management excellence, and follows the latest global practices and standards followed in the area of Orthophoto Production. The process and technology for these activities are expensive, yet O2I ensures the best within your budget, without compromising on the quality and efficacy of the task at hand, by staying true to the project timelines. At Outsource2india, an inhouse team of 70 plus well-trained engineers, with a minimum 2 to 5 years of experience, work on a vast range of projects for global clients and have delivered highly complex and large-scale projects on Orthophoto production solutions. Our team has the expertise in working on various formats including TerraModel TIN, IMAGINE Raster, SOCET SET TIN, ASCII text files, and 3D Shapefile. We use the advanced spatial technology and GIS solutions to achieve the desired results each time every time. We work with utmost accuracy and tread an extra mile to meet clients' requirements. Any scale of Orthophoto production project consists of manipulating huge data that goes into terabytes; with each terrain being different and posing various challenges to photograph, record, and analyze. O2I's experts understand the kind of attention required to create one perfect visual that can be easily referred to for subsequent intelligence gathering. Accuracy at compelling costs is an advantage you receive when you partner with Outsource2india for orthophotography requirements. We respect and understand the need to keep all client information and project related data protected and confidential. We follow strict data security policy towards the same and treat each project of orthophoto production India as classified. Outsource2india works as an extension to your inhouse team and takes up the responsibility of high-quality, in time project delivery from day one. Once you partner with us for Orthophoto Production services, you can stay at ease and leave the entire project related worries to the expert team. O2I works in accordance to the set standards and are highly process oriented. Once the client outlines his/her project brief, share their objectives, and expected results; our team implements the specific procedures outlined by them to achieve the results that will add value to the project. Every step in the project cycle has a clearly defined objective and deliverables mutually agreed upon by both, the O2I team and the client team. There is always an assigned representative within easy reach keeping you posted on the developments and project status at any point of time. We use sharepoint, dropbox, and FTP to share files with customers, which ensures strict data privacy. O2I's Orthophoto Production Services are unparalleled in terms of cost, quality, time. Cutting-edge GIS and spatial technology coupled with professional execution by the team at Outsource2india helps us offer highly reliable Orthophoto Production at affordable cost and promised timelines. Vast domain expertise and adherence to international quality standards by our specialists ensure highest customer satisfaction. For any query related to Ortho photography in India, and to outsource your Orthophoto requirements to Outsource2india, get in touch with us, our executives will get back to you within 24 hours to help get you started.